The Woltman 55DR is a compact drilling rig which has been developed over the past 20 years for soil displacement, CFA and Cased CFA drilling. Woltman rigs have a unique set up which makes it possible to build relatively light and compact rigs with high capacity and outstanding performance. The Woltman 55DR has an operational weight of about 65 tons including rotary head and the most popular options. 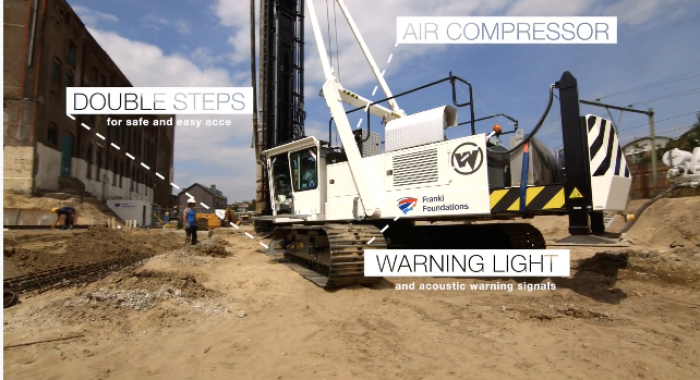 With this rig you are able to drill piles with a max. length of 25 meters in a single stroke. Max. diameter is 1.000 mm however this is depending on drilling method and soil conditions. Have a look at our latest promotional video of this 55DR. If you need any additional information after watching the video we are happy to help you. You can contact our Brett Camm bcamm@pilequip.com.au for detailed specifications of the 55DR please download or 55DR specification sheet.